Do you love to ride your bike? Many of us do. Unfortunately, we can’t always be on our trusty two-wheeled steeds. The real beauty of the bicycle is that it can be used almost anywhere. For this reason, many people like to bring their bikes along with them when they travel. Whether you are a mountain biker travelling to some new trails or a road racer going to the next race, we all need a way to transport our bikes while driving. If you have a truck or a van, you’ve got it covered. For those of us with cars, we usually end up stuffing our bike in the trunk and trying to tie the trunk lid down somewhat. So what do you do if you need the trunk space for storage, and you still want to bring your bike along safely? You get a bike rack for your car. “Why do I need a bike rack for my car?” you ask. If you love your favourite bike as I do, you aren’t about to lash your bike to the roof of your car with straps, rope, twine, or duct tape. You would much rather buy a device that is designed to hold your bike securely during transport. So let’s get to shopping. How do you choose which is the best bike rack for your car? First, let’s look at five great racks I found on the internet and briefly reviewed. Then we will review which factors to consider when shopping for a bike rack for your car. Lastly, I will name the winner or the bike rack that I consider to be the best one. Let’s get started! This bike rack from Hollywood Racks will handle two bikes at the same time. It is designed to strap to the trunk lid of a sedan or onto a hatchback, like a Prius. It will fit most cars, including those with spoilers. This bike rack comes to you in the box fully assembled, so you don’t have to put it together. The weight of this rack is around seven pounds, so it’s pretty easy to handle for everybody. Six adjustable straps with quick-release levers hold the rack and your comfortable bikes firmly in place. Negative remarks I noticed were from people who installed the rack incorrectly and then had some major problems when they took off driving. This is another two bike rack brought to you by Prorack. This one is designed to slide into a trailer hitch receiver. It will work with 1 ¼” or 2” hitches. This rack can be used on any vehicle equipped with a tow package. Initial installation times including adjustment were about 15 minutes. After the adjustments have been made, the installation/removal times were around 4 minutes. 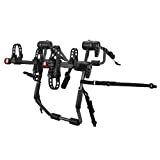 The Bones rack is made from heavy-duty plastic, so it only weighs 13 pounds. This bike rack is available in eight different colors. The pink racks benefit breast cancer research, and the purple ones benefit lymphoma, leukemia, and myeloma research. People who bought this rack love the fact that they don’t have to worry about rust or corrosion due to the plastic construction. Some people had problems trying to put this rack together out of the box. 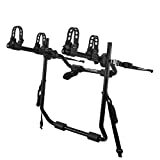 This is a nice economical 2-bike rack from Allen Sports. It is designed to strap onto the trunk of your car, but it will also fit hatchbacks, SUVs, and minivans. This bike rack arrives at your home fully assembled, which saves you time and effort. The weight of this bike rack is 7 ½ pounds, which is nice and light. Five straps with rubber coated hooks hold the rack, and your bikes, in place. Each bike gets individual tie-downs to keep it in place. People who have used this rack like how light and easy to handle it is, and appreciate the ease of installation. They also love the affordable price within the low budget. Negative comments mentioned straps that failed and recommended adding bungee cords for added security. This 2-bike rack from Hollywood Racks also mounts on your trunk. The simple design will fit most sedans, hatchbacks, and minivans. When you buy the Express rack, it comes to you completely assembled to save you the trouble. This bike rack weighs in at 10 ½ pounds, which virtually everybody can handle easily. Four attachment straps secure this rack to your vehicle, while each bike gets two tie-downs to hold it in place. This bike rack can also be ordered in a three bike configuration. Thick padding on the frame protects your car’s paint job from damage. People that purchased the Express rack liked of the quality of construction and how easy the rack is to use. Complaints mentioned that sometimes the padding on the frame can peel off, causing damage to the vehicle. When shopping for a bike rack, the main things to look at are material, the number of attachment points, and weight. For material, I usually prefer steel over plastic because it might bend, but it won’t break. It has a great strength to weight ratio. More attachment points make any rack more secure, so more is always better with outdoor gear. Weight is important because you want a rack that is light enough for you to handle easily and install alone. Combine these factors with the price when you consider which bike rack is the right one for you. If you need to find a good bike rack for your car, all five of the racks listed above are fine choices. The best bike rack for your car out of these five, in my opinion, is the Hollywood Racks Expedition Trunk Mounted Bike Rack. I like that it comes pre-assembled, has six attachment straps, and is narrow enough to fit almost any bike frame size or style. I also like its simple and lightweight design. If you need a good bike rack for your car, the Expedition is a great value for the price.